We all (now) know that the World is curved. At kindergarten we’re told the Earth is like a ball. At high-school we’re told it’s a called a sphere. At college we learn it’s an oblate-spheroid. 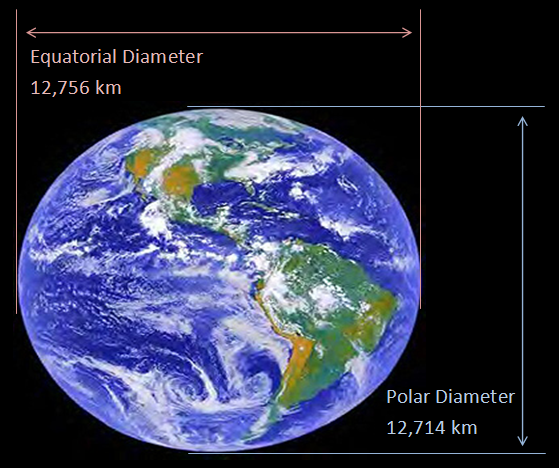 (After millions of years of spinning, it’s a little fatter around the equator than it is going around over the Poles). The difference is small, but very measurable. 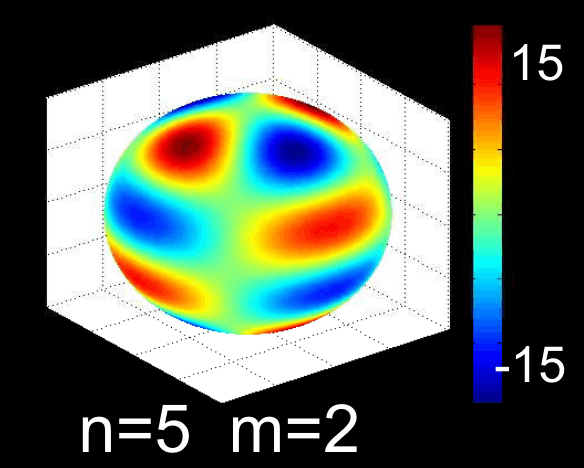 If you go on to study further, you’ll drown in the mathematics of Spherical Harmonics. I’m not going to delve into that today. (I’ve been there, unless math is your passion, you might want to play elsewhere. I have no interest in returning!). Today, we’re going to go back to a kindergarten model and assume the Earth is a round ball. We’re going to look at a couple of consequences of that. First off, how far can you see? How far is the Horizon? Because the World is not flat, you can’t see forever. As you look out to the horizon the planet falls away from you. This limits what you can see. Just how fast does this happen? How far can you see? Let’s break out a little math to find out. If we stick with assumption that the Earth is a sphere (and a smooth and uniform one at that), we can produce a diagram like the one on the left. A man of height h stands on a sphere of radius R and looks out to the horizon. The furthest point he can see is defined by the tangent that grazes the Earth and passes through his eye. By definition, a tangent is normal (perpendicular) to the radius and so we can create a right-angle triangle with a hypotenuse of length (R+h). For the two sides of the right-angle, one will be of length R, and the other will be the distance the man can see (which we’ll label as d). Using Pythagroras, we can creation an equation showing the relationship between all three sides of the triangle. Expanding, then simplifying, allows us to compute an equation giving the distance to the horizon based on the radius of the the planet and the height of the viewer. 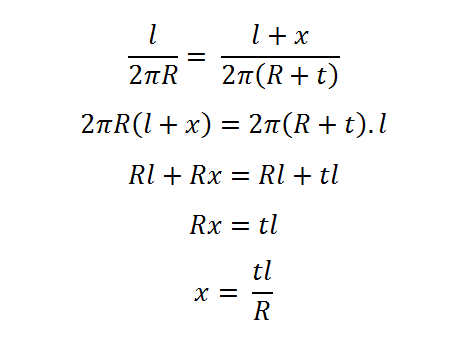 Note – Of the two terms under the square root, the left term dwarfs the right term. I’ll keep it in there, but as we run through some calculations you’ll see that, until we reach a viewing altitude of something like a spacecraft in orbit, it can be ignored. An adult person of around 6 ft tall has eyes approximately 1.8 m above the ground (yes, I’m using the Metric system). 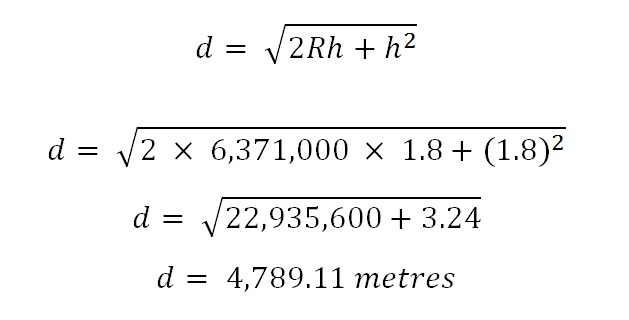 For the radius of the Earth, I’m going to use the value 6,371 Km (the mean radius). 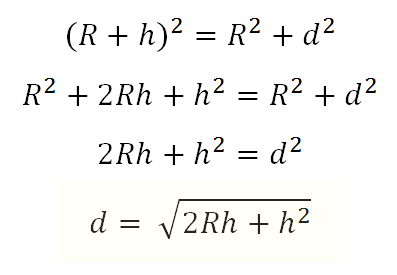 (We can see here, as commented above, that the right little term is dwarfed by the left term involving the radius). The solution is that the furthest an adult can see is 4.79 Km (which is just short of 3 miles). A little child is closer to the ground. An average four year old is around 1 m tall. A child at this height can see just 3.57 Km (Eight tenths of a mile less than an adult). Tip – Put your child on your shoulders, and when they are sitting there, they should be able to spot things on the horizon around half a mile before you! (This is useful to know when dragons are chasing you). What if we’re higher up? The top observation deck of the Eiffel Tower is at 273 m.
From this altitude, the horizon will be 58.98 Km away (36.65 miles). The top floor of the Burj Khalifa tower in Dubai is 621 m high. This would give a viewer a theortical view over the desert of 88.96 Km (55.28 miles). Plugging this into the formula reveals an answer of 384.3 Km, which is 238.8 miles. NOTE – The distance to the horizon we caclulate with our derived forumla is the straight line distance from the viewer to the ground (the edges of the cone in the diagram to the left). 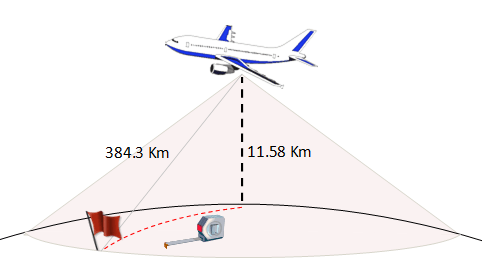 How different is this to the distance that would be measured if we started directly under the plane, and pulled a tape measure around globe to the point where the tangent scrapes the surface? When we were dealing with small altitudes, the difference between the straight line distance, and the ground distance along the curve of a planet was insignificant. Let’s calculate the delta between these two distances for our cruising aircraft. To do this, we’ll use a little trigonometry. Below is a diagram showing the subtended angle (from the center of the Earth) and it’s relationship to the distance to the horizon. If we know the subtended angle, we can determine what ratio this represents of a full circle, and thus what ratio of the circumference this represents. This will give us the distance along the ground betweeen the two points. 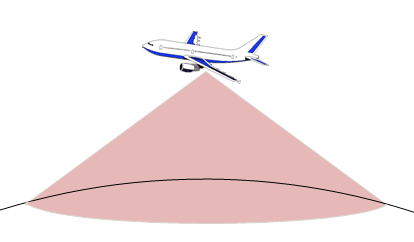 For a plane at high altitude, the difference between the straight line distance to the horizon and the curved distance on the Earth is about 500 m. (The difference when dealing with our first example of a man of height 1.8 m is a fraction of a millimeter). This segues nicely into our next example, the Golden Gate Bridge. The Golden Gate Bridge, possibly the most photographed bridge in the World, spans the opening of San Francisco Bay. Completed in 1937, it boasts two towers of height 230 mand these are 1,280 m apart. 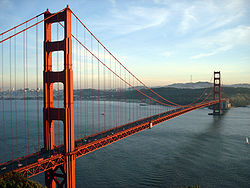 Trivia – Want to paint your house the same color as the Golden Gate Bridge? Here are the CMYK colors: C= Cyan: 0%, M =Magenta: 69%, Y =Yellow: 100%, K = Black: 6%. Because of the curvature of the Earth, the towers are a little wider apart at the top than at the bottom (see exagerate diagram below). Let’s calculate how big this difference is. We’re assuming the towers are constructed perpendicular to the ground. We’ll use l to represent the distance between the two towers at their base (1,280 m), and t to represent the height of the towers above the ground (230 m). We’ll use x to describe the difference between the towers at their tops. Similar to above, we’ll calculate a ratio using the subtended angle. 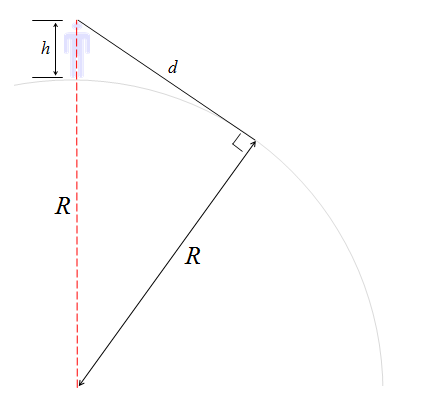 There are two similar segments, one with arc length l and a radius of R, and one with an arc length of l+x and a radius of R+t. Both of these segments share the same subtended angle on the globe. The top equation on the right shows the ratio of the lengths of the arcs to their respective circumferences. A few lines later, and we have a simple formula for the difference between the two arcs. Plugging the values in reveals that x = 46.2 mm (that’s about 113/16“). The top of the Golden Gate Bridge is almost two inches wider at the top than the base because of the curvature of the Earth! Who Discovered The Earth is Round? Indeed, there are many ancient references to the Earth being shaped like a disc. And if you knew only of the two most important astronomical objects in the sky — the Sun and the Moon — you yourself might reach the same conclusions. If you go outside during sunset a day or two after the new moon, here’s the sight you’re likely to encounter. A thin sliver of Moon, where the illuminated portion appears to coincide with the same portion of a sphere that could be lit up by the Sun. If you were both curious and scientifically-minded, you might go out after sunset during the next few days to see what happened next. In fact, if you were to go outside and look towards the southwest skies (assuming you, like me, live in the Northern hemisphere) during the coming days of September 29th to October 3rd, at sunset (~6:30 PM) each night, you’d notice something changing about the Moon. Image generated by me, using the free software stellarium. Not only does it appear to shift position by about 12 degrees each night, moving farther away from the Sun, but it appears that progressively more and more of it gets illuminated! And you would (rightly) conclude that perhaps the Moon orbits the Earth, and that its apparent change in phase is caused by light from the Sun illuminating different parts of a spherically-shaped Moon. In fact, this is both the ancient and modern view of what causes the phases of the Moon. But about twice a year, something special happens during the Full Moon that allows us to determine something about the shape of the Earth: a lunar eclipse! When the Moon is full and the Earth passes directly between the Sun and the Moon, the Earth’s shadow shows up on the Moon’s surface! And if you look at the shadow that actually shows up on the surface of the Moon, you can clearly see that the Earth’s shadow is curved, and shaped like a disc! But this doesn’t tell you whether the Earth is a flat disc or a round sphere; it only tells you that the shadow cast by the Earth is circular. In principle, just from looking at the Moon, the Earth could be either flat or round. But contrary to popular belief, this question wasn’t settled in the 1400s and 1500s (withMagellan’s circumnavigation of the globe), but more than 2,000 years ago, in the ancient world! And what’s perhaps most amazing? It was done using nothing more than the Sun. Here’s how. If you follow the Sun’s path through the daytime sky, and you live in the Northern hemisphere, you’ll find that it rises in the eastern part of the sky, rises up to its apex in the south, and then lowers and sets in the west. And it does this every day of the year. But it doesn’t take the exact same path every day out of the year; the Sun reaches a much higher point (and shines for more hours during the day) during the summer months, and reaches a significantly lower point (and shines for fewer hours) during the winter. To dramatically illustrate this, here’s a time-lapse photo of the Sun’s path through the sky taken during the winter solstice in Fairbanks, Alaska. In fact, if you charted out the Sun’s path through the daytime sky, you would find that it takes its lowest path (for the fewest number of hours) on the Winter Solstice — usually December 21st — and its highest path (for the greatest number of hours) on the Summer Solstice, usually June 21st. If you constructed a camera capable of photographing the Sun’s path through the sky over the course of the year, you would find exactly this: a series of arcs, where the highest, longest arc through the sky was made during the Summer Solstice and the lowest, shortest arc was made during the Winter Solstice. Image credit: High School Physics Teacher Mr. Mallon. And in the ancient world, the greatest scholars and scientists from Egypt, Greece, and all over the Mediterranean went to work at the Library of Alexandria. One of these scientists was the Ancient Greek Astronomer, Eratosthenes of Cyrene. the shadow of someone looking down a deep well would block the reflection of the Sun at noon. In other words, the Sun would be directly overhead at this time, not a single degree to the South, North, East or West. And if you had a completely vertical object, it would cast absolutely no shadow. Image credit: B. A. Perara. But Eratosthenes knew that this wasn’t the case where he was, in Alexandria. Sure, the Sun came closer to being directly overhead at Noon on the Summer Solstice in Alexandria than at any other time during the year, but vertical objects still cast shadows. And — like any good scientist — Eratosthenes did the experiment. By measuring the length of the shadow cast by a vertical stick during the solstice noon, he could figure out what angle the Sun made with the vertical direction at Alexandria. And the answer he got was one-fiftieth of a circle, or 7.2 degrees. But at this time, in Syene, the angle the Sun was making with an identical vertical stick was zero degrees! What could be causing this? In perhaps a stroke of genius, Eratosthenes realized that the Sun’s rays could all be parallel, and that the Earth could be curved! If he could then figure out the distance from Alexandria to Syene, since he knew the angulardifference between the two cities, he could figure out the circumference of the Earth! If only Eratosthenes had a grad student, he could have sent one to make the trip, and measure the distance! Instead, he was forced to rely on the reported distance between the two cities. The most “precise” measurement of his day? Travel-by-camel. (So I can understand criticisms of his accuracy.) Nevertheless, his results were that the distance between Syene and Alexandria were 5,000 stadia. The question, of course, is how big is a stadium? The answer depends, of course, on whether Eratosthenes, a Greek living in Egypt, was using an Attic stadium or an Egyptian stadium, something still debated among historians. An Attic stadium was used more commonly, and is 185 meters in modern terms. Using this value, one gets a circumference of the Earth of 46,620 kilometers, a number that’s only about 16% bigger than the actual value. However, an Egyptian stadium is 157.5 meters, and it’s conceivable that’s what Eratosthenes meant. In that case, we get a value of 39,375 kilometers, which is off by less than 2% from the modern value of 40,041 km! Image credit: E. H. Bunbury. Regardless of what the actual values were, Eratosthenes went on to become the world’s first geographer, inventing the concepts of latitude and longitude that we still use today, and constructed the first models and maps based on a spherical Earth. Although many things were “lost” during the subsequent millenium, neither the idea of a spherical Earth nor the rough knowledge of the Earth’s circumference were one of them. In fact, anyone can perform this same experiment today with two locations at the same longitude, and with simultaneous measurements of shadow lengths, you too can measure the circumference of the Earth! Not bad, considering that the first direct, photographic evidence of the Earth’s curvature would not arrive until 1946! Image credit: U.S. Military, White Sands Naval Base, New Mexico. Once we knew the shape and size of the Earth — from about 240 B.C. — we were able to figure out all sorts of remarkable things, including the size of and distance to the Moon! So give the credit where credit is due, to Eratosthenes, for discovering the Earth was round, and performing the first accurate calculation of its size! If there’s anything Columbus should be known for, as respects the size and shape of the Earth, it was using unrealistically low numbers for the circumference of the Earth! His estimates, that he used to convince others that one could sail from Europe directly to India (were the Americas non-existant), were absurdly small! Had the Americas not existed, he and his crew surely would have starved before reaching Asia!